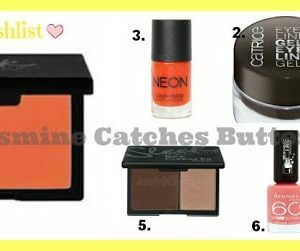 Wet n Wild is one of the few drugstore/highstreet brands that actually carry good quality products for remarkably affordable price tags. 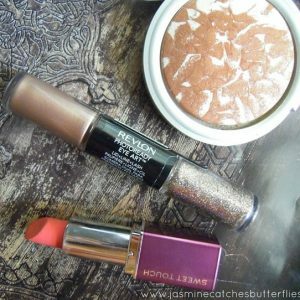 I remember my earliest wishlists on the blog consisted of Wet n Wild eyeshadows and while I still haven’t gotten around to trying any, I was lucky enough to get my hands on the Hollywood Boulevard highlighter and Cherry Picking lipstick. Even though the packaging might be off both of these products are gems for the pricing and you will find out why. This gorgeous baked highlight with streaks of pink and brown is something that I had been lusting after since Fashion Pakistan Week last December. I saw it on somebody I met during that time and immediately gave my heart away. It looked so stunning throughout the night and I was told by its charming wearer that Hollywood Boulevard is supposed to be a dupe of the infamous Becca Champagne Pop. What else was left to even say then? 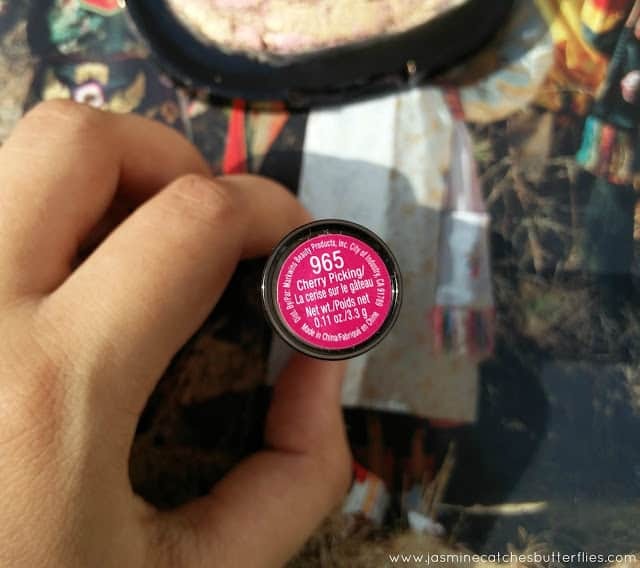 Wet n Wild is not a brand that is sold in stores in Pakistan so after a tireless hunt, I was finally able to get this from Indelath on Facebook. This brings us onto the packaging as the piece I bought was on sale because the product inside had shattered but the seller had been able to press it back in with rubbing alcohol. 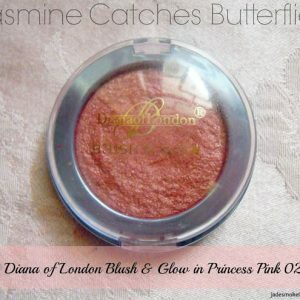 The plastic compact is huge, chunky and flimsy but you get enough highlighter to last you a lifetime. The minute I swatched this highlighter myself, I thanked Lord for it lived up to my expectations and therefore you even saw this in my February Favourites. 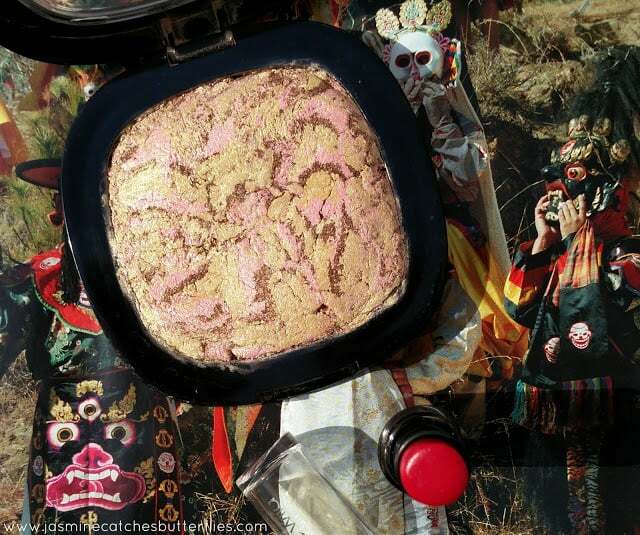 This Shimmer Reflect Palette has finely milled, buttery soft powder that is packed with pigmentation and blends effortlessly but without fading, unlike theBalm Mary-Lou Manizer. 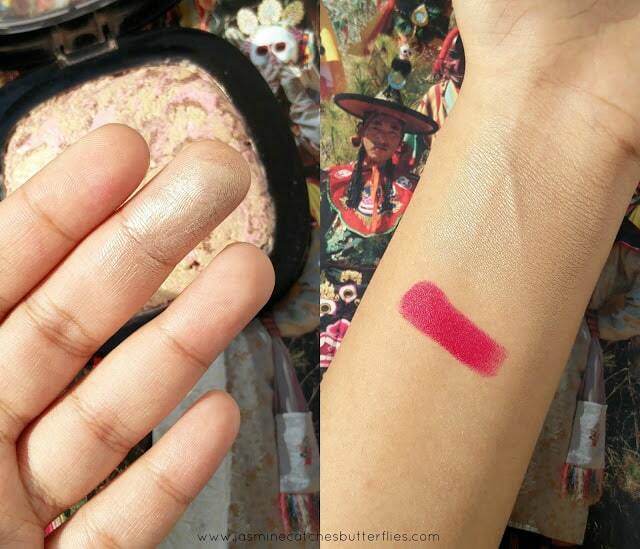 Hollywood Boulevard is a peachy gold shade which is also deeper and bronzer than Mary-Lou so it suits my medium/olive skin tone a lot more (click here for comparison swatches). In addition to that, this also looks better by the hour and I have always been complimented on wearing this. I do not have the budget to afford Champagne Pop right now but on seeing the swatches online, the two do look similar though this fella seems to be a lot more intense and gold while Champagne Pop looks peachier and lighter. I believe that if you dust this with a lighter hand, on certain skin tones, like warm/deep, the two would look identical. Hollywood Boulevard is certainly not the highlight for weak-hearted and if you want something natural, turn away right now. How much a person wants to glow is personal preference as once you get hooked to highlighting, you just want to put on more and more. So, going overboard can make you look sweaty to the infant eyes but people who are used to full glam makeup would adore it anyway. Now since this has an extreme payoff just like any highlighter if you have imperfections, they will be more noticeable so try to keep your base smooth. The photos really don’t do this any justice and I wish I could show how wonderful it looks in real. The highlighter does lose its intensity after some good 4 to 5 hours but even then it is very much there, and you wouldn’t still require much of a touch-up unless you like to be a disco ball. You can use this highlighter wet or dry but it will be really gutsy if you soak your brush for this because BAM, that would be surely blinding. The scent of the product is not really detectable unless you sniff closely but it smells faintly of menthol which is cool, literally. Wet n Wild Shimmer Palette comes in three distinct shades, all of which can be used for adding a glow to your makeup. The range was a collaboration with the American Singer, Fergie of The Black Eyed Peas, so it was out for only a limited amount of time but later made a comeback with just new shade names. Hence, Hollywood Boulevard has now been renamed Boozy Bronze. Availability: Wet n Wild website or look for Facebook sellers. I had always heard people sing praises about the Wet n Wild MegaLast lip colors so I was excited to get one as a gift. There are 26 shades available and even though Cherry Picking is not what I would have chosen myself but that’s the great thing about getting presents as you try out stuff you wouldn’t usually. Now, I am all up for simplistic packaging and I wouldn’t have minded this lipstick’s either only if the stub of the product was not sticking out at all times because it impossible to not mess it up while removing or replacing the cap. I have seen a lot of complaints about this over the years so I wonder why the brand still has not done anything to fix it. Anyways, this lipstick itself is a pretty pink toned red which looks very professional and compliments my complexion. It has a semi-matte finish and while it is not the creamiest matte lipstick I own, it glides on fairly easily. For a shade this bright, I do need to line my lips to apply this as otherwise it is tricky and can get all over the place. The formula is infused with Vitamin E so this is comfortable to wear and does not dry out my lips much or accentuate any flakes. The brand claims 4 hours of wear and without eating and drinking this can last much longer. It mainly fades in the centre after an oily meal and tends to transfer but only feathers a little bit unlike what I had expected. It does stain lips too but not a lot and I find the shade comparable to NYX San Paulo but this is darker and of course, the formulation is different. I could not sense any scent on this lipstick so I think everybody would be comfortable with that. 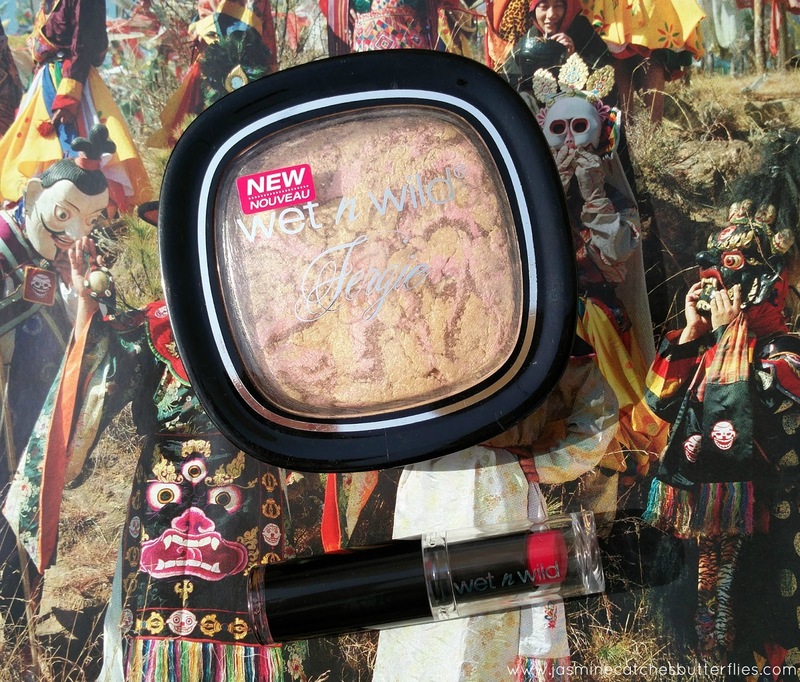 Wet n Wild lived up to its hype for me and I am impressed by both of these products. Let me know what else should I try.